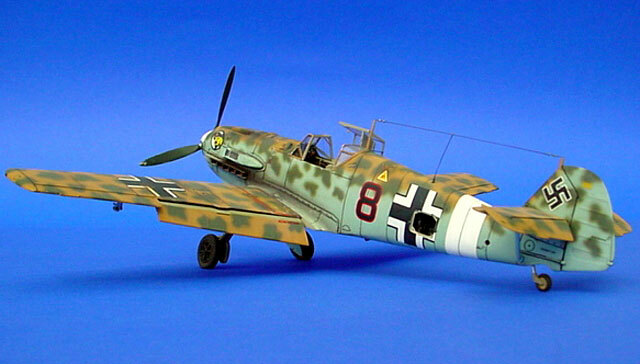 Here is Tamiya`s 1/48 scale Messerschmitt Bf 109 E-7 / Trop. 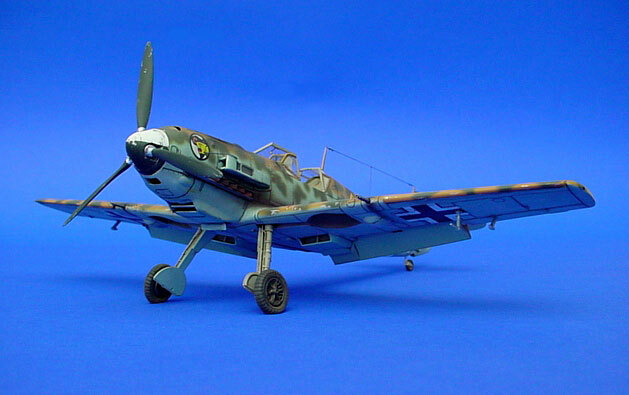 I finished the model in the markings of Lt. Werner Schroer, 8.Grp / JG 27 "Afrika". 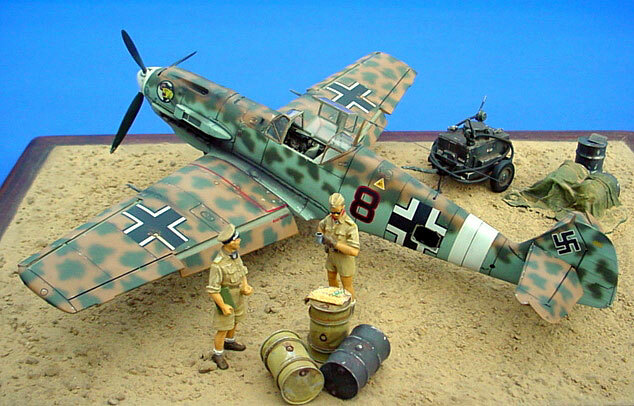 He flew it from Ain El Gazala, Libya, in Sept. 1941. After the E-4 this was my second "Emil" from Tamiya. So I did not await any problems at all. 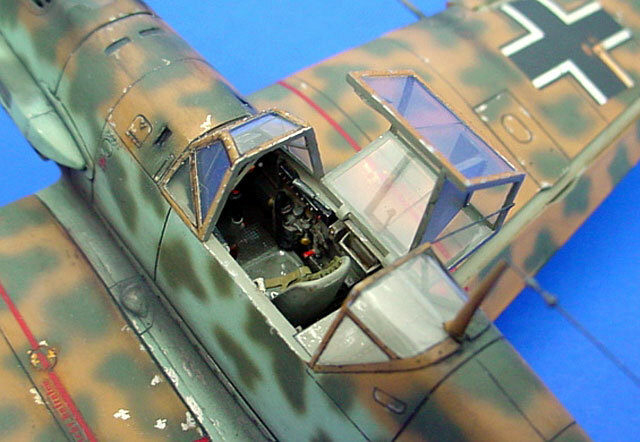 Again I used the Aires cockpit-set and the photoechted parts from Eduard. And because this set offers the possibility for an open radio-set, I decided to show this on the E-7 / Trop. Some parts were delicate in use, but everything fitted well finally. I also placed the elevators in a down position and added some handgrips to the windscreen, followed by the main gear breaklines and the antenna. The exhausts have also been drilled out. For the paint finish, I first sprayed polished aluminium from Humbrol overall, followed by Gunze acrylics for the camouflage scheme in RLM 78 /79 / 80. 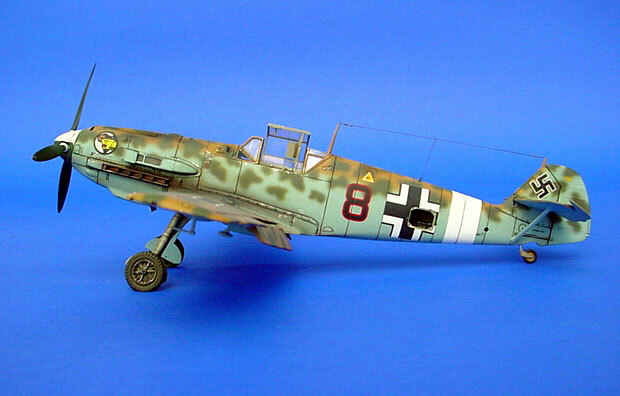 I wanted to avoid a hard colour-line between the fuselage colours RLM 78 and 79, such as might happen using masking tape. Instead of this I used a homemade cardboard stencil for brushing the upside fuselage colour. So it fitted better to the green camouflage pattern in RLM 80. They were sprayed "free hand" and this was the most difficult part of the desert scheme. 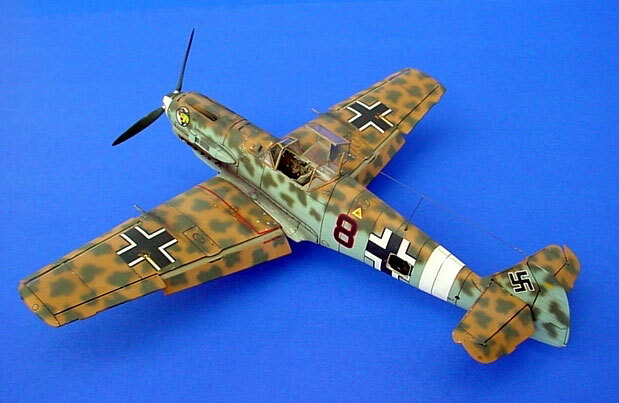 But the result is a nice contrast to other, more normal, camouflage schemes. Then I scratched off the top-colour with a sharp blade to show the aluminium base. After that I sprayed Gunze gloss and attached the decals. 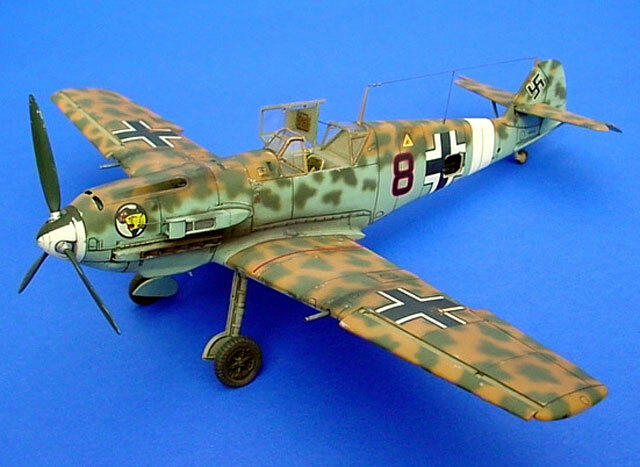 All weathering (panel lines, oiltracks) was added using artists oil colours. The only exception was the soot from the exhauts and guns. I used artists chalk (pastels) for this effect. Finally everything was sealed with Gunze flat.